Most contemporary Christian writing on spiritual growth and development ignores centuries of teaching on the virtues and vices. This unfortunate development misses many rich resources for spiritual formation. It puts us at risk of “misunderstanding both our past and ourselves,” according Rebecca Konyndyk DeYoung. An honest look at our own intellectual history requires that we listen carefully to the wisdom of the past. Unless we have some sense of what our own tradition has to say on the subject, Christians will not know how to engage contemporary challenges to historical conceptions of the vices. What is worth keeping and defending from the past? What insights might enrich our own spiritual formation and confessional practices? What concepts and definitions will enable us to recognize and restore broken aspects of our world and culture? Although her book is about the seven deadly sins, she defines virtue as well as vice and shows how each is formed through our many actions, both large and small. In a book on the vices, we ought to be clear what a vice is. How are vices and virtues distinguished? How is a vice different from sin? Understanding these terms will give us a foundation to explore the tradition and its history in chapter 1, where we will answer questions such as: Where did the list of vices come from? What does it mean to call a set of them “capital vices” or “deadly sins”? Which ones should we single out as “capital,” which as “deadly,” and why? We begin here, however, with the concept of vice itself. Although most references to the lists of seven use “vice” and “sin” in a roughly synonymous way, distinguishing the two turns out to be important. A vice (or its counterpart, a virtue), first of all, is a habit or a character trait. Unlike something we are born with—such as an outgoing personality or a predisposition to have high cholesterol levels—virtues and vices are acquired moral qualities. We can cultivate habits or break them down over time through our repeated actions, and thus we are ultimately responsible for our character. By way of an analogy, think of a winter sledding party, in which a group of people head out to smooth a path through freshly fallen snow. The first sled goes down slowly, carving out a rut. Other sleds follow, over and over, down the same path, smoothing and packing down the snow. After many trips a well-worn groove develops, a path out of which it is hard to steer. The groove enables sleds to stay aligned and on course, gliding rapidly, smoothly, and easily on their way. Character traits are like that: the first run down, which required some effort and tough going, gradually becomes a smooth track that one glides down without further intentional steering. Of course, a rider can always stick out a boot and throw the sled off course, usually damaging the track as well. So too we can act out of character, even after being “in the groove” for a long time. In general, however, habits incline us swiftly, smoothly, and reliably toward certain types of action. Virtues are “excellences” of character, habits or dispositions of character that help us live well as human beings. So, for example, having the virtue of courage enables us to stand firm in a good purpose in the midst of pain or difficulty, when someone without the virtue would run away or give up. A courageous friend stands up for us when our reputation is unfairly maligned, despite risk to his own personal or professional reputation; a courageous mother cares for her sick child through inconvenience, sleepless nights, and exposure to disease. Courage enables us be faithful to other people and our commitments when the going gets rough and so enables the loving, trusting, and secure human relationships that are essential to a good human life. Courageous individuals are still admirable people even when their good purposes are thwarted: when the friend’s reputation becomes unfairly tarnished or when the sick child does not recover. We think it is better to be the sort of parent who suffers for and with her sick child than to be the sort of parent who can’t handle sacrifice and leaves the hard work of caregiving to others. So virtue helps us both to live and act well and to be good people, as Aristotle once famously wrote. Similarly, the vices are corruptive and destructive habits. They undermine both our goodness of character and our living and acting well. In the chapters that follow, we will explain how wrath, lust, gluttony, and the rest have a corrosive effect on our lives—how they eat away at our ability to see things clearly, appreciate things as we ought, live in healthy relationships with others, and refrain from self-destructive patterns of behavior. Virtues and vices are gradually internalized and become firm and settled through years of formation. Often we develop habits by imitating those around us or following their instruction. We may or may not be intentional about all of our habit formation. For example, most children develop habits by imitating their parents, and in this way both virtues and vices can “rub off,” so to speak. Other times, habit formation is the cumulative effect of many small, casual choices, similar to developing a smoking habit. Someone who wants to quit smoking after many years, or break any habit, needs serious deliberation and self-discipline. Sometimes we have a crisis that brings a new perspective. We see ourselves as if for the first time and want to change. But to make good on that desire to change, we have to wrestle daily against a deeply ingrained habit—and wrestle, perhaps, for the rest of our lives. Very simply, a virtue (or vice) is acquired through practice— repeated activity that increases our proficiency at the activity and gradually forms our character. Alasdair MacIntyre describes a child learning to play chess to illustrate the process of habit formation.14 Imagine, writes MacIntyre, that in hopes of teaching an uninterested seven-year-old to play chess, you offer the child candy—one piece to play, and another piece if the child wins the game. Motivated by his sweet tooth, the child agrees. At first, he plays for the candy alone. (And he will cheat to win, in order to get more candy.) But the more the child plays, the better at chess he gets. And the better at chess he gets, the more he enjoys the game, eventually coming to enjoy the game for itself. At this point in the process, he is no longer playing for the candy; now the child is playing because he enjoys chess and wants to play well. And he understands both the intrinsic value of the game and the way cheating will now rob him of that value. He has become a chess player. Moral formation in virtue works much the same way. We often need external incentives and sanctions to get us through the initial stages of the process, when our old, entrenched desires still pull us toward the opposite behavior. But with encouragement, discipline, and often a role model or mentor, practice can make things feel more natural and enjoyable as we gradually develop the internal values and desires corresponding to our outward behavior. Virtue often develops, that is, from the outside in. This is why, when we want to re-form our character from vice to virtue, we often need to practice and persevere in regular spiritual disciplines and formational practices for a lengthy period of time. There is no quick and easy substitute for daily repetition over the long haul. First we have to pull the sled out of the old rut, and then gradually build up a new track. Dr. DeYoung goes on to show how historical discussions of the virtues and vices are grounded in the New Testament teachings about putting off the “old self” and becoming a “new self” that is being formed increasingly into the character of Christ. In other words, the moral project for a Christian is to die to the old self and rise to new life in Christ. This dying and rising is the rhythm of a life of discipleship, a life devoted to becoming more and more like Christ. Centuries before the advent of Christianity, the Greek philosopher Aristotle wrote that virtues and vices describe aspects of our character that become “second nature” to us. This makes the vices especially apt for describing our old sinful nature, and the virtues, for our new nature in Christ. 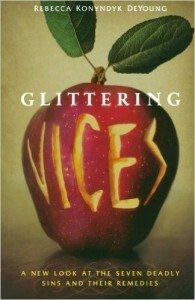 This extended excerpt is from the Introduction to Glittering Vices: A New Look at the Seven Deadly Sins and Their Remedies by Rebecca Konyndyk DeYoung. The entire Introduction in available online here. To what extent does DeYoung focus on *individual* virtues and vices, and to what extent does she focus on *relational* virtues and vices? For example, gossip, acting against 2 Cor 5:16, and eschewing the law of Christ indicated in Gal 6:1–5 effectively prohibit the development and deepening of relationships between the kind of diverse groups of people Jesus mentions in Mt 5:43–48. Failure to obey Mt 5:23–24, Mt 18:15–20, and Eph 4:25–27 allow rifts and fractures to grow, destroying the unity spoken of seven times in the beginning of Eph 4. Now, he’s picking out something very specific when he talks about “the moral”. But I sense the danger is deeply linked to our Enlightenment gift of individualism. One might say that Brunner’s morality’ describes what you *don’t do* to other people; his ‘responsibility’ adds what you *do do* to other people, or perhaps better stated, what *do with* other people. After all, the kingdom of God is of cooperation and service, not coercion (e.g. Mt 20:20–28). I think Brunner’s onto something, here.